Wansdyke crosses the A 361 at this point, which makes it by far the most accessible, combined with very fine views. A minus though is the lack of parking space, for the farm here is privately owned and may not be very happy with large numbers of visitors turning up. However, one can always ask for permission. There is a public footpath leading in both directions (Wansdyke Path), with means one is allowed to cross the farmyard. By car from Swindon. Follow the A 4361 tto Wroughton and on to Avebury. You will drive right through the ancient Stone Circle and a visit can only be recommended! Drive through Avebury to the roundabout, then take the A 361 to Devizes. About halfway is Shepherds' Shore Farm, where you may park if the farmer allows it. From here, the Wansdyke Path can be followed in either direction to Morgan's Hill or Tan Hill and beyond. By car from Calne and Chippenham. Follow the A 4 to Avebury. At the roundabout take the A 361 to Devizes, then continue as described above. By car from Devizes. Follow the A 361 to Avebury and Swindon. About halfway is Shepherds' Shore Farm, where you may park if the farmer allows it. From here, the Wansdyke Path can be followed in either direction to Morgan's Hill or Tan Hill and beyond. By car from Marlborough. Follow the A 4 towards Avebury. At the roundabout take the A 361 to Devizes, then continue as described above. Only to be reached on foot. Wansdyke crosses very gently rising Downland here, with good views all around, from Morgan's Hill to Tan Hill. Just west of this point, Wansdyke makes a strange curve, to use a Romano-British enclosure. The bank and ditch are very well develped here, which makes is a good point to visit. By car from Swindon. Follow the A 4361 tto Wroughton and on to Avebury. You will drive right through the ancient Stone Circle and a visit can only be recommended! Drive through Avebury to the roundabout, then take the A 361 to Devizes. About halfway is Shepherds' Shore, where you may park if the farmer allows it. Continue on foot across Wansdyke for about 2.5 kms, until you reach a barn, situated on the line of Wansdyke. Alternatively, if you don't mind a good walk, you can take a public path that starts at Durran Farm, close by the Avebury roundabout. This route is about 4 kms, and will take you to a point between Brown's Barn and Tan Hill. By car from Devizes. Follow the A 361 to Avebury and Swindon. About halfway is Shepherds' Shore Farm, where you may park if the farmer allows it, then continue as described above. Alternatively, if you don't mind a good walk, on leaving Devizes take the road right to Horton and Alton Barnes. When you've crossed the Kenneth & Avon canal for the second time, stop at the first farm to the left, and park the car (but please ask for permission!). A public path of about 2.5 kms will take you straight north, along Harepath Farm (which Saxon name Herepath shows this was an ancient army road). Along the crest you'll pass strip lynchets, remains of ancient farming, just before reaching the Romano-British enclosure. Only to be reached on foot. Tan Hill is one of the highest points crossed by Wansdyke, which keeps to the northern slope of the hill. The views north are breathtaking, and a short walk to the crest sees the Vale of Pewsey strechted out to the south, with Salisbury Plain beyond. By car from Swindon. Follow the A 4361 tto Wroughton and on to Avebury. You will drive right through the ancient Stone Circle and a visit can only be recommended! Drive through Avebury to the roundabout, then take the A 361 to Devizes. 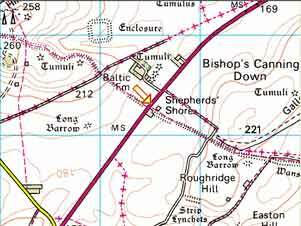 Before Devizes, take the left road to Horton and Alton Barnes. Park in the village of Allington and continue across a public footpath that will take you after 2 kms to a point between Brown's Barn and Tan Hill. 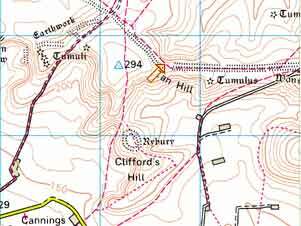 Alternatively, you can take a public path that starts at Cannings Cross farm, 1km further east. This public footpath will take you along Rybury hillfort. Alternatively, you can take a public path that starts at Durran Farm, close by the Avebury roundabout. This route is about 4 kms, and will take you to a point between Brown's Barn and Tan Hill. Alternatively, if you don't mind a good walk, stop at Shepherds' Shore, where you may park if the farmer allows it. Continue on foot across Wansdyke for about 4 kms, until you reach Tan Hill. By car from Devizes. Follow the A 361 to Avebury and Swindon. On leaving Devizes take the right road to Horton and Alton Barnes. Then continue as described above. 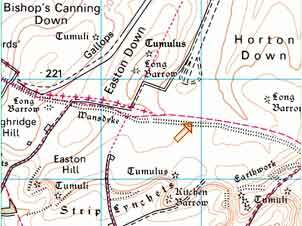 click here to return to East Wansdyke, section 8.